Police have located the source of a fatal poisoning in the UK town of Amesbury, involving the same Novichok nerve agent used in the assassination attempt on a former Russian spy in nearby Salisbury earlier this year. Tests at the Defence Science and Technology Laboratory revealed a small bottle found in the house of one of the victims – Charlie Rowley – was contaminated with the nerve agent. Investigators had been looking for a container handled by Rowley and his partner Dawn Sturgess who were both taken ill and rushed to hospital on 30 June. It was later established their symptoms were due to poisoning with a Novichok agent. Sturgess has since died and Rowley remains in intensive care. Police say they have been working under the assumption that the poisoning is related to that of Sergei and Yulia Skripal in March, but are still unsure exactly what happened. There is little publicly available information about this class of nerve agents, but this latest incident – and the way officials have been dealing with it – suggests they are designed to be persistent in the environment, unlike the nerve agent sarin, which is volatile and breaks down rapidly. Novichoks work by disrupting the body’s nervous system. They bind to a serine amino acid in the enzyme acetylcholinesterase, which normally breaks down the neurotransmitter acetylcholine. As the acetylcholine builds up, the victim can suffer from convulsions, paralysis and respiratory arrest that can cause death. Victims can be treated with drugs such as pralidoxime that break the bond between the nerve agent and the enzyme. They were developed in Russia as part of a secret chemical weapons programme in the 1970s and 80s. The word ‘novichok’ means ‘newcomer’. They are binary agents formed by mixing two relatively benign precursor chemicals just before use, which makes them safer to handle. For security reasons, there is little publicly accessible information about the compounds themselves and how they are made. They are thought to be organophosphates similar in structure to the nerve agent VX. What we do know comes from Russian whistleblowers and chemists in Iran who synthesised small Novichok samples to analyse them. In April 2018, independent investigators from the Organisation for the Prohibition of Chemical Weapons verified that a Novichok agent was used in the attempted assassination of former Russian spy Sergei Skripal in Salisbury, UK. The agency came to no conclusion on who was responsible for the poisoning as this was not part of its remit at the time. This has now changed. 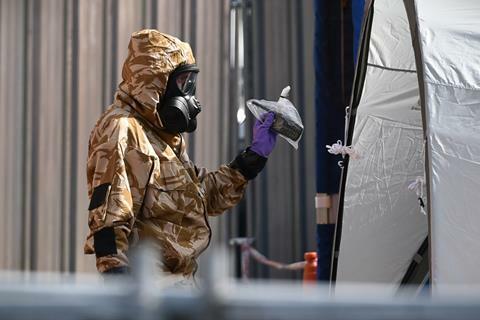 As well as investigating the source, scientists will be making efforts to decontaminate the areas that could have come into contact with the nerve agent. Rowley and his partner potentially visited a number of locations in Salisbury and Amesbury in between being exposed and falling ill, including private residences in both towns, a church, a pharmacy and Queen Elizabeth Gardens in Salisbury. Police cordons are still in effect around some of these areas, although as the bottle was found in Rowley’s house the risk to the public is thought to be low. He adds that investigators may remove items for public reassurance – paving slabs and soil in some parts of Salisbury were taken away after the Skripal poisoning, for example. But most decontamination efforts are likely to be chemical-based. As a precaution, Public Health England has issued advice to people in the area not to touch any foreign objects that could have contained liquid or gel, including containers, lids, syringes or needles. The question of how the Novichok-containing bottle came to be in the couple’s possession in the first place remains unanswered. In a chemistry publication, I am disappointed to see the word "volatile" used in an ambiguous way. Did she mean volatile as in forms vapors and evaporates (the usual technical term) or unpredictable or unstable (the usual meaning in the explosives industry)? In the trade press the word is often used to mean explosive--causing much confusion. I have lobbied for use of the forms vapors and evaporates definition. The Associated Press has adopted this usage in the US. The story doesn't seem to say that. The police are still operating under the assumption the bottle contained the nerve agent that poisoned the Skripals and the Sturgesses came across it - and they've just identified suspects this morning. And they're Russian.